Volunteer Appreciation Week | Thank you to all of our wonderful volunteers! The great things happening here would not be possible without the strong community of support we have! Happy Volunteer Appreciation Week! Most non-profits rely heavily on the passion, time, and support of volunteers. West Texas Rehab is no different! Getting our start in 1953 would not have been possible without the vast array of volunteers who stepped in to help our organization begin serving the community. 66 years later this need is still being met by so many individuals all over West Texas. We cannot say THANK YOU enough! Each year we have more than 50 fundraising events. These events are often run, managed, and some of them are even organized by members of the comunity who are volunteering their time. This is a great time to thank our volunteers, because a group of close to 100 are gearing up to help us this weekend with the Spring Chicken Affair and 5K! Between cooking, serving, setting up, delivering meals, etc. we have help going in all directions! For events such as our clay shoot, which happened earlier this month, we have volunteers who help at each station, and at the auction that night. And of course, we cannot forget to highlight the wonderful help and work of our volunteers at our annual Telethon and Auction! At Telethon each year we have so many from the community who come and volunteer to assist in setting up the event, participating in the phonothon, and more. These events are definitely community supported and community involved as our volunteers come from all over and include a variety of student groups, our board members, and local businesses. There are so many opportunities to get involved in different communities including Sonora, Snyder, and Ozona. We couldn't sustain the events on staff alone, and there are so many who help with each one we cannot show enough gratitude! It truly takes the heart of a volunteer to ensure the success of these events. In addition to our fundraising opportunities, we have volunteers who come and help us within our day to day as well! We have wonderful volunteers who help us from RSVP (Retired and Senior Volunteer Program) who fill many needs and roles within our organization. We have Bass Fishermen who join us in organizing a day of fishing through CAST (catch a special thrill) for kids. One of our extra special times each year is Camp Rehab (in both San Angelo, and Abilene). At Camp each of our kids is paired up with a camp buddy who they have fun with over the coures of 3 days. We have so many buddies, and other volunteers who come make this summer camp experience a special memory for each of our campers! We have a team of wonderful volunteers at both of our Hospice locations as well, and some furry friends (and their owners) who give love and care to our patients in this tough time. Honestly this is barely the tip of the iceberg. We have so many who show up, give back, help out, and support all that we at the West Texas Rehab do, and we could not do all we do without this amazing community! 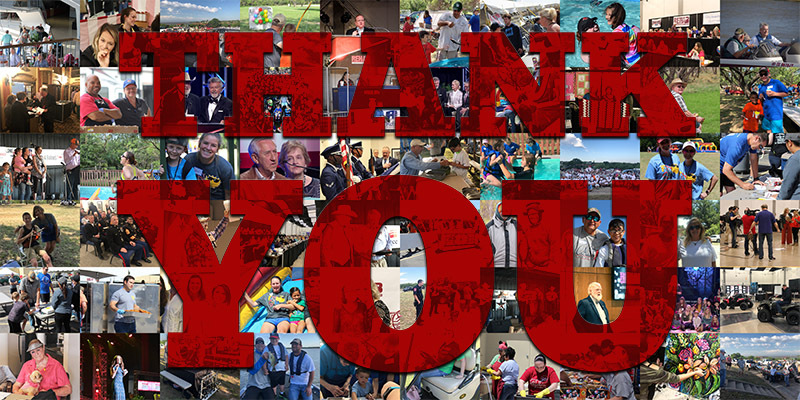 THANK YOU all so much for allowing us do what we do, and helping make great things happen here every day! If you are ever interested in volunteering at WTRC give us a call! We would love to have you join our team!